Wired’s New Site Is LIVE!!! Awwwww yeah! I’m one week from setting off on 9 months of hiking, and I now have the platform to optimally share it with everyone! After 5yrs on the archaic Blogger hosted website I started haphazardly, I’ve finally gotten the site migrated over to the WordPress hosting platform where the possibilities are endless. Migrating almost 700 posts and 5yrs of hiking content is a HUGE undertaking that I am in no way qualified to do. This is where the miracle worker, Carrie Carter (of Carrie-Carter design + code) stepped in. Carrie is a fellow Portlander and she is able to do website design and migration stuff for anyone anywhere remotely. I won’t even go into the details and the time that it took to make this happen, but I feel like after doing this for me, Carrie could do anything! 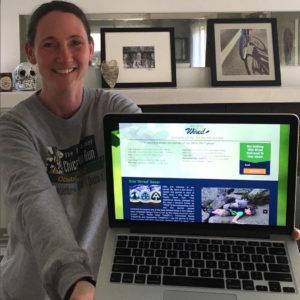 I had heard it would be virtually impossible to migrate all I had over to WordPress without losing content or having to link to the old site, but Carrie found a way to make it happen and took the site above an beyond anything I ever thought would be possible. THANK YOU SO MUCH Carrie!!! I won’t say too much here as you can navigate around yourself, but I do want to say what my intention is with the site. Most importantly, I want it to feel like me. Those of you that have been with me from that first moment (when I cried at the start of the PCT) to completing the triple crown, and moving on to more remote and challenging hikes, I think you will love it! For those of you just coming in on this journey, you can easily go back on the previous seasons and binge read just like you do when House of Cards comes out on Netflix each year. I want it to be content driven in a clear and concise way that both shares the journey with everyone while also being a resource to other hikers. I LOVE how this all came together! With so much varied content(text, video, photo, audio), it was difficult to find a good way to organize it all, but Carrie made it happen. Click around on a desktop for the full experience. Some features are muted on tablets and phones for optimal viewing on smaller devices. Notice how I got to keep my original background, yay! Carrie is soon going to import all the comments to past posts from Disqus the last 5yrs. That’s HUGE for me and has major sentimental value. Plus, now you all are going to have a much more user friendly way of commenting on future posts through what is setup now for commenting on the site. For each trail, there are links to every day’s post, my gear used on that hike, photos, videos (mostly PCT & CDT), and any other important links associated to that hike. Check out the live and interactive map on my “Where’s Wired” tab to see where I’m headed in about a week. The Gear tab has a whole new layout and I have to thank Rockin’ for her guidance on that one! Rockin’s gear page is awesome! I’m really happy with the presentation of the various podcasts I’ve been on in the “About Me” tab. Lastly, I want to say THANK YOU to Drew from Force Brand Design for the newly designed Wired logo (with assistance from Carrie as well!). The original concept came from my friend Funhog who made my original Wired stamp back in 2011 and now it’s evolved to what you see on the site. Ok, enough from me, go see for yourself and stay tuned for more posts this week to kick off this upcoming year of hiking! Final Note: If you are already a subscriber (and got this post through email) there is no need to subscribe again. Your name was already added to the new mailing list. Gmail users, it may fall in your Promotions folder, but if you pull it into your Inbox folder, it will land there for all future mailings. *One more note. If you find a glitch anywhere or something that isn’t working, please email me. Some things seem to be happening on some computers that I’m not experiencing on mine (like the large avatars some are seeing in the comments, but not others). I appreciate knowing so we can get them fixed. I’m digging on the new site Erin. And love the new improved logo. I wish all the best in your next nine months. Now that is a vacation for sure! Wonderful! Happy hiking. Looking forward to following along. Wooo! It looks so amazing and is so easy to use. Immensely helpful information categorized cleanly? Nailed it! So happy to see you’re ready to get moving again. Wishing you the best in the months ahead. Stay Healthy….! Waiting for your new hike to begin. I love armchair hiking, especially today as I am stiff and sore after a scramble (I was told all I had to do was walk up the mountain) up Turtle Mountain. You will remember, seeing Frank Slide in the Crowsnest Pass. That is Turtle Mtn. Given my tender age that will be the first and last scramble up a mountain ridge. I love that I know what you’re talking about with the Frank Slide reference. Have a great summer Doug! So happy you checked this off your list before the coming hike. The site looks great. Congratulations. I am excited to follow you out on the trail again!!!! Congrats Wired with getting all of this updated. I’m sure this is a huge weight off your shoulders. Have a great safe vacation.. Were all looking forward to it.. So good to hear from you, Wired! Thanks for thinking of me. I’ve pretty much finished my tenth season of Trail Angeling at Eagle Rock. I have been following you since your first steps on the PCT and am certainly not going to stop now. Your new site looks fantastic and if the map is loaded with your next trip it too looks like a wired adventure. Who is hiking with you Rockin? Of course Rockin’…and also Why Not! We are a fan of this unit and are looking forward to some pretty darn epic stuff out there with snow still yet to melt. My ankles are happy to have less talus though! Good for you Wired! I like WordPress too. Have a wonderful 9 months of hiking. Coming at ya from the island of Mauritius. I fly to Madagascar in an hour to join Francis Tapon, his wife Rejoice and Symbiosis in their in progress thru hike. Good luck all around! Yay! The site looks great, i’m so glad that you were able to get everything migrated over. Hats off to Carrie! Looking forward to following along with you and Rockin this summer, and then beyond as you head down under. You have come and gone so far. I can’t wait to see what happens next. With the new site I might have to go back and binge watch the PCT to re-live that epic adventure. (It is my favorite, second to the AT section with Cartwheel and Robinhood which is in a tie with Balls and Sunshine) Who knows what is next? That is the Beauty of your adventure! Very cool, Wired! I hope your next 9 months are filled with incredible views, great friends, trail angels, many miles, and excellent food! The sit elooks and navigates great.Looking forward to following you this season.Good luck and happy trails! Erin, looking forward to officially following you and not just on FB! I remember getting to see your food packages being organized for the PCT back in 2011 in Portland and being in awe of the whole process. Here’s to your upcoming chapter! That’s great Maureen! It’s never too late to jump in. Your new site looks GREAT Wired! Look forward to following you another year. Didn’t see any postings on supply needs this year so we will assume your are good to go? That’s very sweet of you Glenn & Carol. I will be swinging through Portland by the end of Aug if you’d like to send anything, but I’m all set until then. I’m quite happy with how Carrie laid out the Care Packages section on the About Me tab. Erin, can I be you? All the best on your amazing adventure. Awesome. I will follow as usual. Erin, great new look! My question is what happened to the RSS feed? The old RSS feed is coming up blank, and I’m not seeing the RSS feed option, which is how I’ve followed you for several years now. Good luck on the impending hikes – they look great! Hi JP, we added the RSS link to the top of the blog. Thanks for mentioning that one! Thanks, works great! Good luck on SHR etc. Can’t wait to read about it. Fantastic Erin. I too found you as you hiked the PCT. I have just been walking in the Columbia Gorge. When I saw Cascade Locks and the Bridge of the Gods I was just so excited to be on a small part of where you had trod. So looking forward to this years adventures. Happy safe hiking!